First, I hope that you had a wonderful Mother’s Day on the weekend. Personally, I don’t think Mother’s Day is strictly for biological mothers; I think it’s anyone who is a mom, is ‘just like’ a mom, an auntie, a mom to a fur-baby, or that best friend who looks out for you. I was thoroughly spoiled; I received a beautiful bouquet and a necklace from one son, and chocolates and dinner out from the other! No, my hubby didn’t forget – I got a gorgeous hanging flower basket, which I ask for every year. 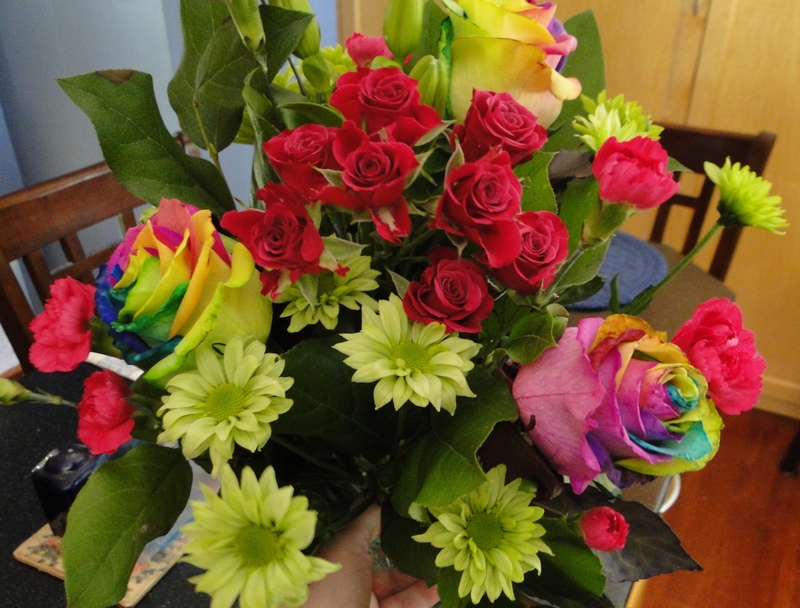 Aren’t these flowers gorgeous?! 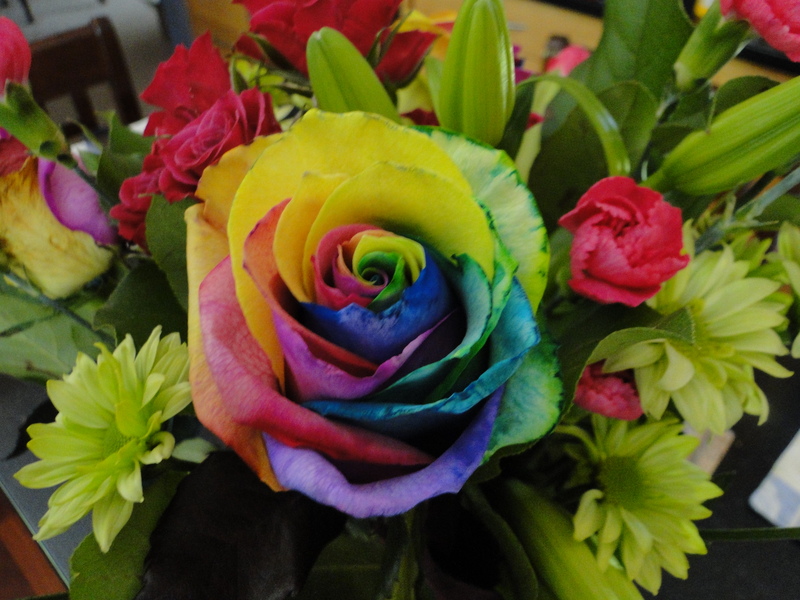 Take a closer look at the amazing rainbow roses! 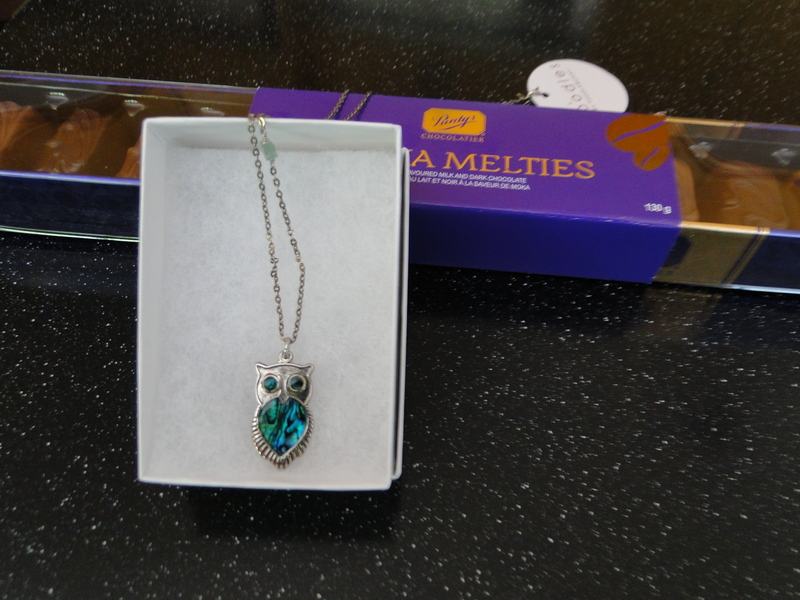 Don’t you just love my silver and turquoise owl? See – I told you I was spoiled! Well, it wasn’t all dinners and chocolates; I did make some cards, as well! I hope you’ll come back tomorrow for the Watercooler Wednesday challenge – it’s my turn to host, and you’re going to love it! I also have a great card for the theme challenge with the Paper Craft Crew – so be sure you don’t miss it! I also made some thank you cards, which I always tuck inside my customer’s orders, when I deliver them. I’m so glad that the Bold Butterfly and Butterfly Basics aren’t retiring! I used one of my favourite colour combinations of Blackberry Bliss, Crumb Cake and Very Vanilla. The sentiment is from the Sheltering Tree stamp set. I did just send out my Newsletter, as well. If you haven’t already subscribed, you can do that by going to THIS PAGE here on my blog; fill in your deets, and you’re good to go! I send out my newsletter once per month; if there are any urgent specials or time limited announcements, I’ll send out those as well, but not to worry – I won’t spam you with messages, nor do I sell my contacts list (that’s just wrong!). I did advise in my newsletter that NOW is a good time to STOCK UP ON ESSENTIALS, such as your cardstock, ink pads, refills, etc., as there will be an average 7% overall price increase effective June 1st, with the release of the new catalogue. The increases will apply to all products, not just the new items, with the exception of the Big Shot and it’s platforms. (for example, ink pads will be $8.50 from $8; cardstock will be $10 from $8.75; DSP will go up by $1.25; Trimmer will increase to $40; etc.). While the increases aren’t huge, they can add up, and I like to let you know that they are coming, since I’m aware of them, and you can stock up now. You can also still order from the Retiring Products list – there are still lots of products available, and the stamp sets will continue to be manufactured until May 22nd. After that, it’s while supplies last only. You can see the Retiring Products HERE in my online store – you can combine the retiring products with regular items, and Clearance Rack items, all on the same order. You can place your order directly through my online store, or feel free to send me an email or phone call, and I’ll be happy to place your order for you. Please do come back tomorrow to see my design team challenge cards – and get ready to join the fun! I subscribe to your blog – I have for a while now. I always look at your creations. Most of the time I really like your stuff and I rarely stop to take the time to leave a comment. Sometimes I pin them, sometimes I don’t. We work together on WCW and BFBH….. I decided as I’m pinning this to leave some kind words about this card. It’s so pretty! I need to step out of my box and layer stamp like this – it’s quite pretty! Great job!